I hired Jenn as a health coach as I had issues with yo-yo dieting and never getting any permanent results. I could see it was an unhealthy lifestyle to have my weight go up and down like it was. One of my challenges, I was buying 6 to 8 and sometimes even a whole box of protein bars a week. I would eat at least 1 a day but sometimes 2 a day. We came up with a plan to eliminate those from my routine as they were not serving my body with good nutrition. Well, I did eliminate them but a few months later I was traveling and in a pinch bought one of those bars I use to eat all the time and thought was “healthy.” My first bite it tasted like total crap! After eating 1/2 of it because I had nothing else I threw it away. The thing tasted like chemicals in my mouth. I use to think this protein bar was so healthy and tasted so wonderful. Boy, I was wrong! And I have to say I love being binge free, it always felt like it held me captive in moving forward in my life and now it feels like I’ve been set free from just a bad habit. I connected with Jenn for business purposes through a friend’s recommendation. Her wisdom, sass, and powerfully feminine personality were readily apparent and I could tell she was a kindred spirit with great information to share. With Jenn’s help, I’ve discovered how changing some things in my diet can truly affect my day to day productivity and overall health. She is showing me how the foods I eat play a role in my migraines. I’ve struggled with migraines for half of my life now. I’m afraid of them. Slowly, working through my diet and cutting out some key factors, I’m experiencing fewer migraines now. Which means, I’m more productive and have higher billings each month as a result. How’s that for an ROI? I highly recommend Jenn for those that are tired of hitting a wall at 3 PM each day, that are tired of feeling OK each day and want to feel fabulous and full of energy. For someone who takes control of most situations, Jen helped me realize that I had very little control over my eating. Who knew that what we eat controls so much of who we are (inside and out!). My energy, attitude and general sense of self is so much better when I control the things I choose to eat. And while I thought it was easy to simply, ‘eat better’, Jenn coached me into seeing that I didn’t know as much as I thought. Ghee, real cream, and avocados are staples in my fridge now. I learned we must treat ourselves and see ourselves as special, but eating comfort foods actually does the opposite! So when I sip on my glass of wine this weekend, I will feel content, knowing that I have learned the balance and if I tip, I will remember how good Jenn helped me feel and I’ll set myself straight! Thank you Jenn, you really are one-of-a-kind! I’ve been working with Jenn for a year and a half, and it’s funny because initially I hired her as my business coach to help propel my health coaching career, but as life would have it, things changed, and she evolved into, what I like to call my LIFE coach. We now talk the whole enchilada – business and health. I couldn’t imagine my life without her in some capacity. Jenn’s combination of nutritional expertise, holistic philosophy and intuitive, loving energy has been just what I needed to change my attitudes about food and eating habits. Thanks Jenn! You’re a gem! After suffering with migraines for the last 10 years and going to many doctors, having brain scans, taking loads of supplements and toxic drugs and getting nowhere, Jenn ultimately changed my life! She was able to realize that dehydration was the thing that was triggering my headaches. I would never have believed it until I started drinking water! Now because of Jenn, when I do feel a headache coming on, I run to the kitchen sink instead of the medicine cabinet and within no time, the pain is gone. I am forever grateful to Jenn for her insightfulness and caring as a healer. I was very unhappy about my expanding waistline that had continued to increase over the past 5 years. Frustrated, I tried different methods from the Atkins Diet to my own diet restrictions not realizing that food wasn’t the problem at all. Jenn right away confirmed everything I was going through and told me that if I was serious about making changes in my life she could help me. She has this gentle way of making you realize things in your self that maybe not have been discovered ~ this is what I am most grateful for. Jenn taught me things that blew me away – yes about food (I am an expert now) but all areas of life. I feel ALIVE and ENERGIZED and have dropped those unwanted pounds all at the same time. “Me go to a nutritionist? Never”. Those were the words that came out my mouth before I met Jenn. Eight months later I am a whole new person. I did a complete 360. I am actually happy now. Not only did I see a physical change with my body but also emotional and spiritual as well. Jenn helped me understand what was going on with my body. She was my stepping-stone for long term change with my severe IBS and psoriasis when I was deep in that hole with no one to turn to. She was definitely my life coach. There are not enough words to describe Jenn. She is just an amazing person who just wants to help. Jenn helped me realize that i had been living my life as a one-woman show. she helped me envision a new approach that involved partnering and support, as opposed to doing everything on my own all the time. i am now making smarter decisions about what events i plan and making sure i have equitable partners to help promote them. Working with Jenn was the most fullfilling experience as well as the best investment in myself! Our sessions always left me excited about my possibilities and my future, and made a tremendous difference in my confidence. I feel like every minute of our conversation included tremendous value for my professional life and my own self-growth. Jenn’s style of coaching is authentic and direct which resonated so well with me. I am definitely becoming more skilled at growing my business and am starting to attract more clients as we continue. Thanks Jenn. 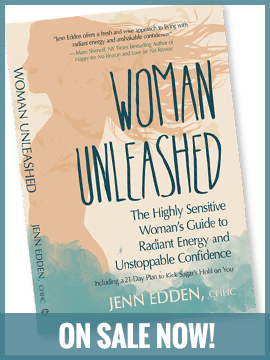 Jenn Edden’s coaching has greatly impacted my business. Last year when I started my business, she helped to motivate me into action. She was there to support me this year through some challenging times and recommended a book that changed my relationship with money. She raised a point with me that got me to make some changes that tripled the amount of business I was getting by pulling me out of a period of being “stuck”. She brought me into a new place that I needed to be with her fun, upbeat and motivating words. I am most grateful.